Designed / launched by whom/when: Class was designed in 2009 by Matteo Nunziati for Poliform. Matteo opened his own design studio in Milan in 2000. He has worked on numerous hotel / residences and public buildings in Dubai and China and taught at the Design Institute Milan and University of Taipei. Fabrication: Cabinet of timber panels with rovere spessart oak (walnut) veneer. Base and legs in burnished metal. Hidden Features: One soft close drawer on metal ball bearing runners. Two drop front cupboards either side. Design Consigned Stylist: Elegant and perfectly proportioned cabinet for dining or living room storage. Place below an artwork or use as a media unit. 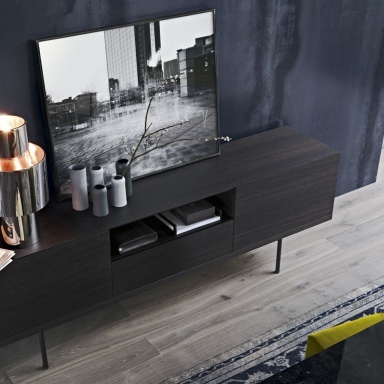 Design Consigned Collector: Authentic original, made in Italy by Poliform.